Galerie Durand-Ruel, Paris (no. 3325), by whom acquired from the artist on 11 June 1895. Paul Durand-Ruel, Paris, by 1901. Paris, Galerie Durand-Ruel, Renoir, May - October 1958, no. 10. Munich, Städtische Galerie, Renoir, November - December 1958, no. 8 (illustrated). Recklinghausen, Städtische Kunsthalle, May - July 1959, no. 264. Recklinghausen, Städtische Kunsthalle, Zauber des Lichtes, June - July 1967, no. 157 (illustrated). Paris, Galerie Durand-Ruel, Renoir intime, January - February 1969, no. 7. Recklinghausen, Städtische Kunsthalle, Ruhrfestspiele: Europäische Gemeinsamkeit, May - June 1979, no. 240 (illustrated p. 111). Painted in 1879 La Seine à Bougival was painted in the same year as Renoir had his first major success at the Paris Salon. In that year Renoir sent his large group portrait 'Mme Charpentier and her children' which was met with critical acclaim. Castagnary highly praised Renoir's 'agile and intellectual brush', his 'lively and happy grace', the enchantment of his colour' (quoted in J. Rewald, The History of Impressionism, New York, 1980, p. 424) and more importantly to him the painting was applauded by the other Impressionists including Pissarro who wrote to Murer 'Renoir has a big success at the Salon... I believe he is launched. So much the better! Poverty is so hard' (Ibid p. 430). Following this success Renoir spent some of the Summer of 1879 at Berneval with the Bérards on the Normandy coast, friends he had met through the Charpentiers. 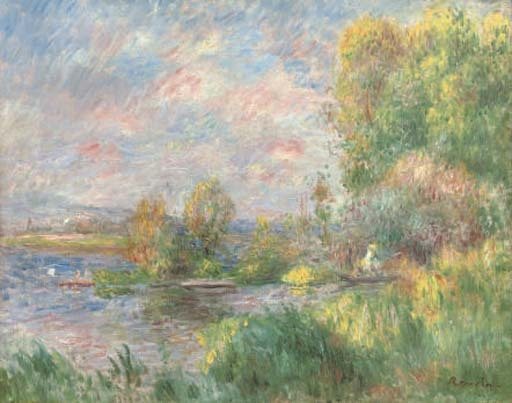 Renoir returned from the coast to paint sumptuous riverscapes along the Seine, such as La Seine à Bougival, and Les Rameurs à Chatou (now in the National Gallery of Art, Washington, D.C.), canvases which are filled with sunlight and radiant water.